Is safety a concern while conducting in-stadium throwing events? Do you have a turf infield and therefore can't use traditional 'stick in the ground' pennant holders? Gill has your solution! Now available are the Gill Turf Chute Posts. 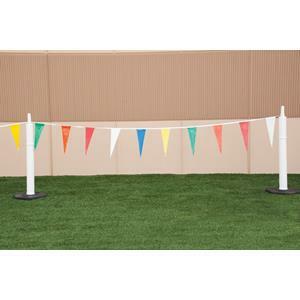 With a base of 12lb this non-invasive chute post is sure to stand up to the strongest winds while safely holding a streamer of pennants to keep participants safe. Increase the safety of your on the turf throwing events today! Great for indoor facilities too!